Do you want silky, shiny and gorgeous hair? Are you tired of your boring, dull and lifeless hair? 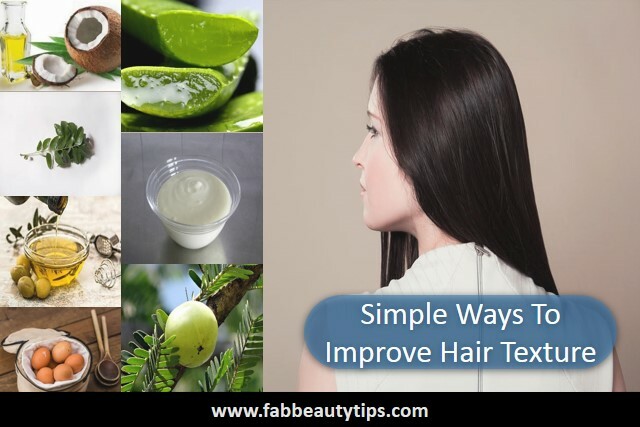 If yes then you are on the right way, give a read to the this article and find out some amazing tips to improve hair texture. If you don’t know your hair texture and type of hair then you should first be clear about the texture and type of hair. So here are some ways that help you to know your hair type and texture. The texture of hair is determined by the thickness of your hair strand and the condition of the cuticle. Whether the hair is of wavy, straight or curly type, the are three textures – medium, fine or thin and the thick. Fine or thin hair are look translucent in light. When you roll a strand of thin or fine hair you hardly feel it and it feels like a strand of silk. They are of silky type, so making hairstyle is bit difficult for fine hair type of people. Medium hair is neither coarse nor fine. When the hair strand between index finger and thumb , you would feel the strand like a cotton thread. They do not tend to break easily. They are of bouncy type. Thick hair is also called as coarse hair. When you rolled a strand of hair between your index finger and thumb you feel it wiry and hard. It considered as the strongest of all hair textures. They can hold several hairstyles quiet well which helps you to look good. Same as hair texture, human hair also are of different types. There are four types of hair – Straight, Wavy, Curly, And Tightly curled. These type of hair are naturally straight. They are shiny and oily because they have no curls. There are three sub categories. Flat from the root up to the tips. This group is not completely flat and will hold curls. This category of hair is straight, has body and few areas are wavy. This type of hair blends slightly. These are naturally wavy. This type of hair is neither oily nor dry. These are also of 3 categories. First kind has loose and natural waves all over the scalp. The second kind has waves, these type of hair doesn’t have a bounce. The third kind also have waves that form loose spiral curls. These are of frizzy type. These type of hair is S-shaped and curled naturally. They tend to be dry and the natural oil found on the scalp is not heavy. These hair also have 3 sub categories. The first kind is silky and curly. The second hair are of spiral and springy curls and are extremely frizzy. The last kind of hair has oily curls; they are closely packed and look clumpy. These hair are tightly curled and coiled type. They keep their shape whether wet or dry. The natural oil do not come down to tips. They feel wiry and dry. They shrink by more than half of its real length. How to improve hair texture? Coconut oil helps to improve the texture of the hair. It has good properties to moisturize the scalp, helps to grow hair and protect the hair from breakage and split ends. Massage coconut oil into your scalp and hair. Keep it for 1 hour and then wash it with the mild shampoo. Don’t forget to apply conditioner. Or you can mix coconut oil with any hair mask. Amla improve hair texture to an extent. It rich in antioxidants and vitamin c, which is necessary to improve hair texture. Using Amla powder or raw Amla give you shine and improve hair growth also. Apply amla powder by mixing in some kind of hair packs. Aloe Vera is enriched with so many nutrients which help you to gain healthy hair. It promotes hair growth, adds shine to hair, makes them strong by root, prevent split ends and frizziness and it definitely improve hair texture. Apply it directly or by mixing in some kind of hair packs. The easiest way to improve hair texture and treat dull hair by applying olive oil to the scalp and hair. Olive oil is enriched in vitamin E, which helps hair to grow fast and make them thick. Massage olive oil to your scalp and hair. Keep it for 1 hour and then wash it with the mild shampoo. Don’t forget to apply conditioner. For any problem of hair there is a perfect solution that is egg. Presence of protein in eggs are necessary for improving the hair texture and also makes the hair shiny and soft. It makes the hair silky and also improve hair texture and hair growth too. Eggs can be applied directly or by mixing in some hair packs. Curry leaves are full of benefits for the hair. They treat damaged hair, cut hair fall and thinning, prevent premature hair greying and much more. Curry leaves can be applied directly by making paste or powder or can used in any oil for the hair. Yogurt is a multivitamin rich food which has high level of lactic acid that is quite beneficial to treat dry and damaged hair. Yogurt helps to get rid of dandruff, tame hair frizz, add shine to dull hair and last but not the least reduces the hair fall. These seven simple and easily available items will give you the perfect hair by improving the hair texture. Follow these tips regularly and make the people jealous of your healthy and shiny hair. I didn’t know about the olive oil that its helps to hair grow fast. Definitely I’ll try this☺. Natural ways are the best way for growing your hair fast. I have tried out a few of them, and I will definitely trying the ones I haven’t. Well my hair texture is wavy and frizzy. And I totally agree with you on using these natural ingredients to improve the shine and bounce. Thanks for sharing these natural ways to improve the hair quality. That’s a great compilation. I’m all for oil massages and don’t shampoo my hair unless they’re oiled. These are some great tips.